Our aim was to deepen comprehension around the She Move Mountains campaign, through personal stories of ambassadors and cultural influencers, pushing for reach and reads from a targeted UK female audience. Huck provides a unique and credible platform for unfiltered voices of women who are making change: Pioneers, explore and adventurers who are leading the way in a brave, new, and more equitable world. In this groundbreaking editorial partnership we reached and inspired over 12 million women across the UK with original content combining beautiful motivating stories and photography on women who are redefining what it means to go outside and explore. She's a woman; She's badass - and she will inspire the next generation of female explorers. For each story we reframed the editorial slant to appeal to different sections of our audience, while promoting features through original multi-media assets across our portfolio. 15% of reach was organic and via social outreach to online communities. At just 17, Ashima is climbing's fastest-rising star. She began bouldering aged six, started smashing records at 11 and can outclimb her peers regardless of age or gender. Is Ashima Shiraishi the revolution that rock climbing needs? Fernanda Maciel set a world record when she was the first female to ever run to the summit of Argentina’s Aconcagua mountain. But for a woman who grew up in a family of fighters, running up mountains is all in a day’s work, and the stuff of dreams. The DJ who took a u-turn to follow her dream in life. Carly Wilford had it all – from the perfect house to the successful business. But something was missing. Now, as a DJ bridging the gender divide, she’s found her calling. Megan is a survival expert who consults adventure TV shows like The Island, helping to keep celebrities alive in the wild. She may be the only woman in a field of macho men, says longtime friend Bear Grylls, but she’s stronger than 99% of the guys. Young Brits are facing an epidemic of anxiety, but the Outward Bound Trust is turning things around by getting them out in the wilderness. 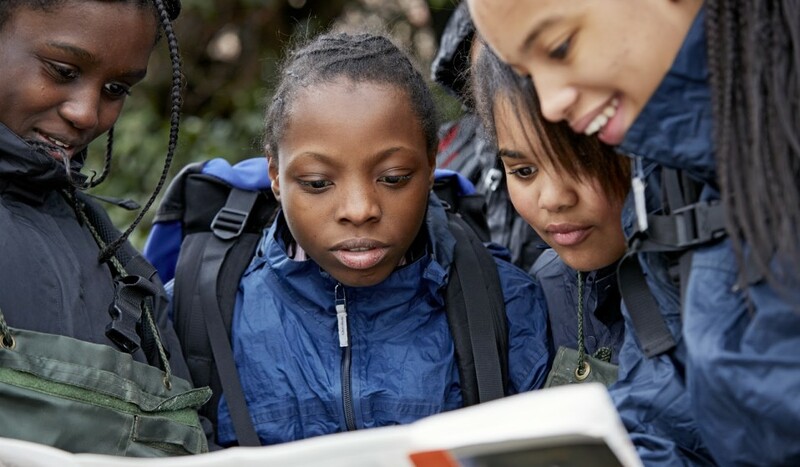 The North Face is sponsoring 50% of the fee for girls aged 13-19 to take part in programmes through the summer.